Fuelled by rage and armed with heavy machinery, Nels sets out to dismantle the cartel one man at a time, but his understanding of murder comes mainly from what he read in a crime novel. As the bodies pile up, his actions ignite a turf war between Viking and his long-standing rival White Bull (Tom Jackson), a soulful Native-American mafia boss, that will quickly escalate and turn the small town’s bright white slopes blood-red. The 'Cold Pursuit' competition has now closed. Winners will be announced shortly. Competition opens at 5pm AEDT on Sunday 27th January 2019 and closes at 11:59pm AEDT on Sunday 3rd February 2019. Five winners will be chosen at random on Monday 4th February 2019. To successfully win, entrants must fulfil the above entry conditions before the time the competition closes. Current members/followers are eligible to enter the competition. Only one entry per person. Only one winner per household. To be a valid winner, the entrant must not have won a prize from SWITCH within the last 28 days. Each winner will receive one double pass to 'Cold Pursuit'. By entering, you agree to receive occasional emails from SWITCH in the future. If you decide to unsubscribe from these updates, any further entries will not be applicable. Only Australian residents are eligible to enter. 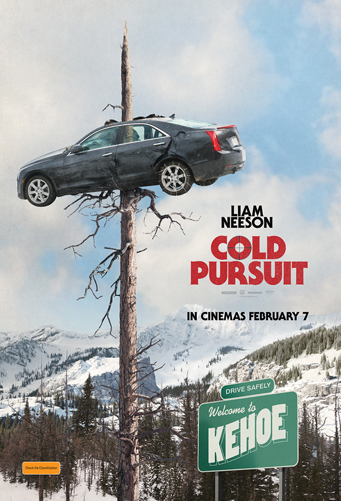 'Cold Pursuit' is in cinemas from Thursday the 7th February 2019 through StudioCanal.